An easy recipe for Blueberry Vanilla Pancakes made with whole wheat flour, vanilla soymilk and studded with fresh blueberries throughout. 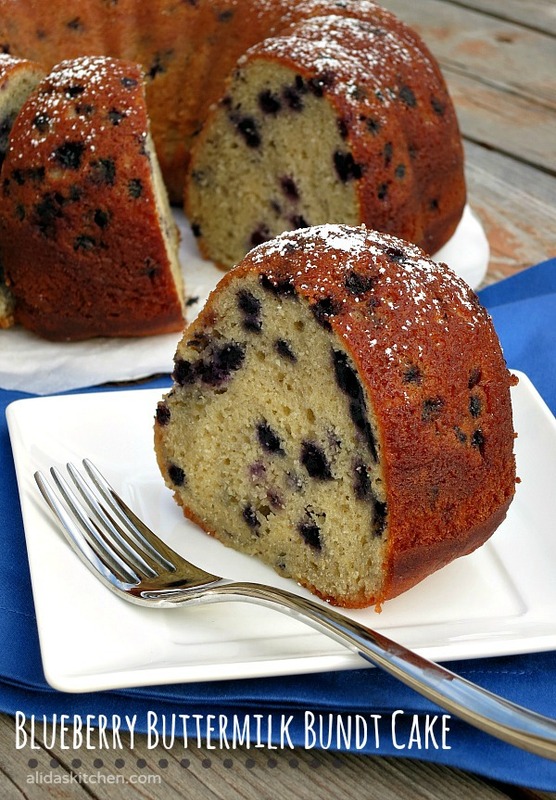 Blueberry Buttermilk Bundt Cake is a sweet, tangy vanilla cake bursting with juicy blueberries throughout. So simple, delicious and easy! All summer, I was planning to make a blueberry buttermilk cake, however my family eats through containers of blueberries so quickly, I never had enough to make the cake. Fast forward to a few weeks ago, I ran across this recipe for a Lemon Blueberry Cake. With a few modifications, I thought this recipe could become a perfect Blueberry Buttermilk Bundt Cake. I became obsessed with making this recipe, despite our love for everything pumpkin this time of year. Mid-fall is not really blueberry season. Have I told you lately that I love summer produce? Because I do! This weekend we are planning a visit to our local farm to pick up several pounds of blueberries. I am so excited! While we love to eat plain blueberries by the handful, I have a long list of great recipes using blueberries that I can’t wait to share with you! So in honor, and anticipation, of our future blueberry windfall, I would like to share with you my favorite blueberry muffin recipe. Years ago, I was flipping through a Bon Apetit magazine, and this recipe for blueberry muffins caught my eye. It just so happened to be an advertisement for Pam Cooking Spray – go figure! Now I know that I promised you a break from yogurt recipes, and well…I stuck to that for over a week. It would simply not be fair to keep this recipe from you any longer. These muffins rock! The beauty of using yogurt in baked goods means that you can use less oil/butter, which makes them a healthier option. These muffins also contain oats, which provide a little texture that goes well with the juicy blueberries. And what more can I say about the blueberry-lemon combination – it just works. Over the years, I have made these muffins using different types of flours and yogurts. This time, I made them using whole wheat pastry flour and Greek yogurt. These muffins are just as delicious using all-purpose flour and/or regular yogurt, so use what you have or go crazy and try something different! Preheat oven to 425 degrees. Prepare 12-cup regular muffin pan with cooking spray or liners. Whisk together flour, oats, brown sugar, baking powder, baking soda in a large bowl. In a small bowl, mix together yogurt, oil, egg and vanilla. Divide batter evenly between prepared muffin cups. Bake 12-14 minutes or until a toothpick inserted in the center comes out clean. Cool 5 minutes in pan, then remove from muffin pan and cool completely on wire rack. Blueberry Lemon Ricotta Pancakes are made with whole wheat flour, studded with blueberries and a bright flavor from the lemon. These are a wonderful breakfast treat! Recently, my favorite (well,…only) pancake turner met an early and unfortunate demise. Let’s just say the combination of a very hot pan, quesadillas sticking to said pan and a non-silicone turner resulted in a slightly melted pancake turner (and a slightly not pleased Alida). Now I am armed and dangerous with a fancy silicone pancake turner, ready to take on the world…of pancakes! What better way to christen this handy new tool than by making ricotta pancakes. Ricotta pancakes are delicate to flip, so they’re sure to put this new device to the test. Not just any ricotta pancake recipe would do, however. It was time to liven up my go-to ricotta pancake recipe from Everyday Food. First I swapped lemon zest for the orange zest, and whole wheat pastry flour for the all-purpose flour. I then decided to add vanilla and blueberries to the recipe. The result was fabulous! We thought they were perfect without any topping, though you could add a little confectioners’ sugar or maple syrup, if desired. While these pancakes are easy to make, the batter is quite thick, thus requiring a few extra minutes to cook and extra care when flipping. In the end, it is all worth it – trust me! In a medium bowl. whisk together ricotta cheese, sugar, eggs, grated lemon zest and vanilla extract. Fold in flour until just combined; add blueberries, gently mixing until combined. Spray large non-stick skillet with cooking spray and heat to medium-low heat. Add batter, using a scant ¼ cup for each pancake. Cook until browned, 4 to 5 minutes per side. Transfer pancakes to a paper towel-lined plate. Serve hot, with confectioners' sugar or maple syrup, if desired.